The area of Côte Chalonnaise has much going for it. Most importantly, the wines are some of Burgundy‘s best value for money. A premier cru will cost you around £25 a bottle. The village wines cost even less, but except in very good vintages it usually pays to trade up. Secondly, the wines evolve fast. The whites are ready after a year or 18 months in bottle, the reds soften and mellow a few years after that. And they will keep. The 2010 and 2009 whites are holding up well. And I still have 2002 reds in my cellar, which are delicious. 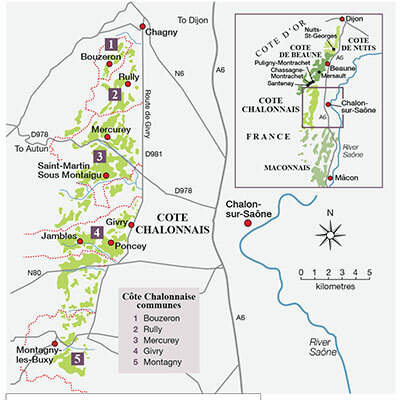 The Côte Chalonnaise spans five communes, beginning to the southeast – and closer to the River Saône – of Santenay, the southernmost commune of the Côte d’Or. The soil is largely crumbly limestone, without the hard rock found in the Côte de Nuits and in Chassagne-Montrachet, mixed variously with clay, gravel and sand, and with marl on higher slopes, this latter absent in the Côte d’Or.